Home » Films » How advances in technology has changed the way movies are edited. 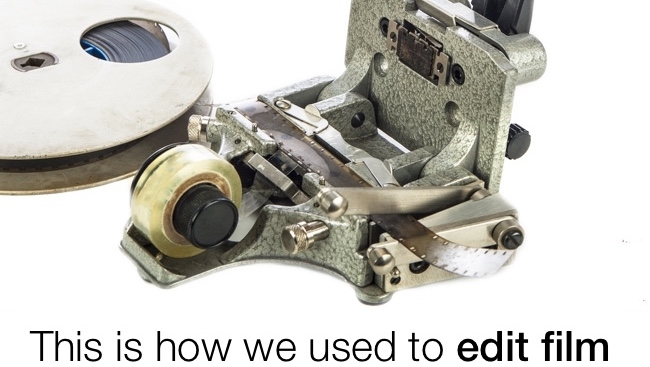 How advances in technology has changed the way movies are edited. Technical innovations change the way we make films — usually, but not always, for the better. The search is always on to make films faster and cheaper with higher picture quality and more spectacular effects, but technology also has an influence on the kind of films we find ourselves making. In a future part I’m going look at all this in relation to cameras, but firstly, some examples in the world of editing. I’ll start with a history lesson. Just one piece of equipment can change the way we edit. Take something, for instance, as simple as the guillotine tape splicer, introduced by CIR of Italy in the late 1960s (by tape splicer, I mean a splicer for joining film using transparent sticky tape, not a splicer for joining audio tape, although they existed too). The magic lantern was an early form of slide projector that was an early step on the road to the motion picture technology of today. The transition from black and white to color movies.